The original landowners of the Atterbury Army Air Base/Bakalar Air Base property. 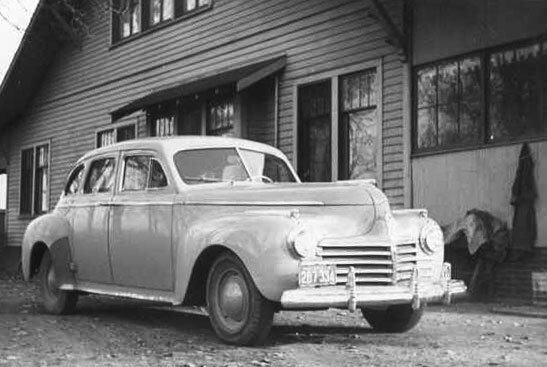 Captain Stratton Hammon notes: "On July 29, 1942, when there had barely been time to become acquainted with the area engineer and his two lieutenants, I was ordered back to the district office. 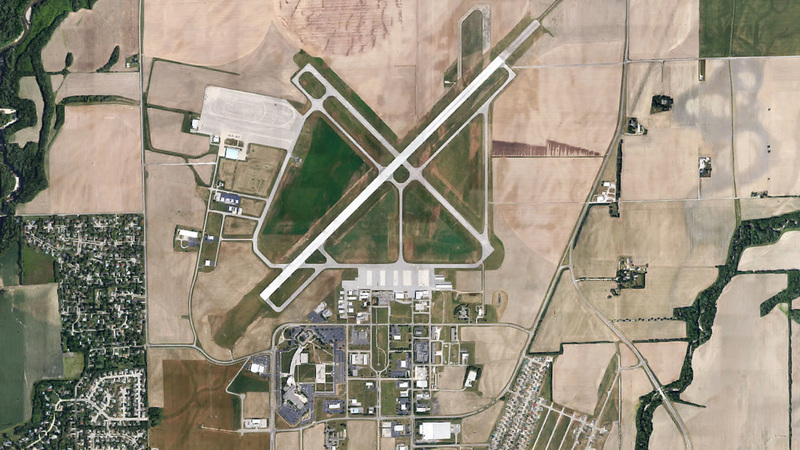 Here I was told by Major Gill that the colonel had appointed me area engineer, commanding officer, and contracting officer of an Army airfield, with all customary facilities, to be built 70 miles to the north of Louisville in Columbus, Indiana. I was handed a one-sheet, two-paragraph letter of authority which stated that I had only five months to get a group of farmers off their land and have military planes flying in." Captain Stratton Hammon notes: "We obtained a court order allowing us to survey a two-square mile tract even before the farmers realized that they would have to move off the land some of their ancestors had obtained by service in the Revolutionary War. August 10, 1942 "May have to move grave of first settler." "Bartholomew Counties first settler, Joseph Cox, died November 26, 1851 and was buried at the edge of the Middle Road on the Mrs. Flora G. Stickler farm in the flying field area." "Many of the early pioneers are buried in Liberty Cemetery, which is just inside the north boundary of the field." 'There is also a small cemetery on the Henry Voelz farm, also in the flying field zone. This is a family cemetery know as the Hopkins Cemetery and most of the burials there were made in or near the 1840's, the family is that of Edridge Hopkins, who came to the Hawpatch in 1827." "Actual work on Air Base started today August 8, 1942." "Two guards were stationed in the area and a guard system is being organized." "Start grading work on Army Air Base here August 21, 1942." "Several of the farmers who live in the area are helping clear the fields so that grading work can go forward." 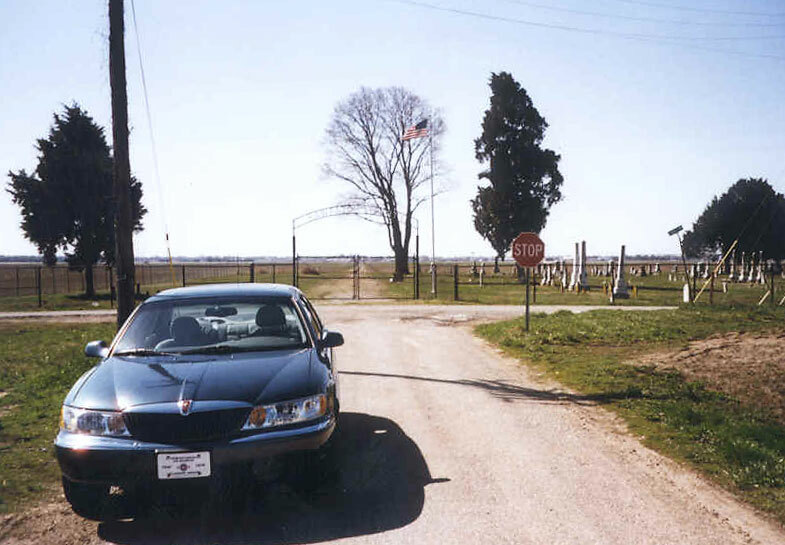 "Plans are being made for moving graves from two small cemeteries inside the air base area." Present plans call for moving them to Liberty." "Roads through Air Base Site closed today August 24, 1942." "Graves were moved today to Liberty." Liberty Cemetery circa 1942 and Hawpatch-Liberty Cemetery over six decades later. "A number of farm families near the flying field are planning to provide sleeping rooms for the air base workers." "Deliver firs air base check September 30, 1942. The first check in payment for land taken by the government was delivered to the former owners Tuesday. The check went to Mr.. and Mrs. Wallace D. Waltz. The check was for $8,781 and was in payment for 40.08 acres of land, including their residence, other improvements and crops." "Farmers wishing to buy the remaining corn and soybeans may enter bids at any time now. Bids are to be made at the land acquisition office on the 3rd floor of the Bassett Building, October 3, 1942." "Third air base landowner paid October 15, 1942. The check was delivered to Mrs. Mary G. McCullough and amounted to $53,035 for a total of 368 acres, including crops, building and other improvements. The payment figured at $144.11 an acre." "A 4th check in payment for land was delivered this week October, 28, 1942. It was for $38,104 to Walter Steinker for 177.2 acres of land and improvements." "Two more are paid for land, November 7, 1942. Mrs. Flora C. Strickler of Franklin was paid $12,028 for 73.275 acres and Harry Boegaholz, Jr., received $5,542 for 40 acres. "Residence in way of planes, November 11, 1942. One house located outside the Columbus Base will have to be moved because it is in the way of planes which will be taking off and landing on the field. 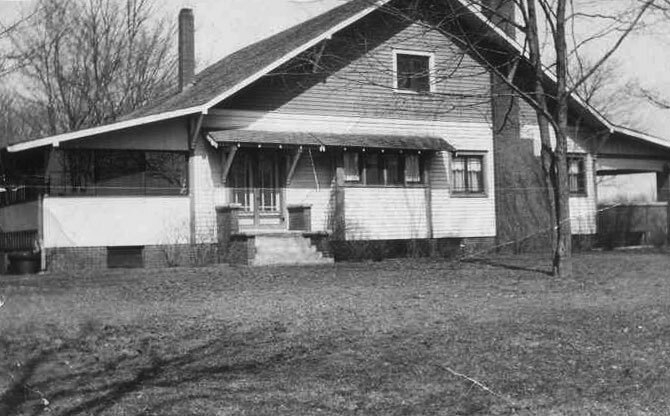 It is the residence of Mr. and Mrs. Charles Wetzel on the Mrs. Dorothy Perry Bahr farm, located west of the base area. The house can be moved approximately 200 ft. north of its present site and will then be out of the planes' range." 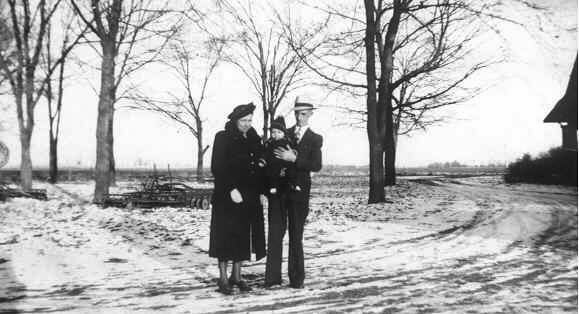 "3 at Grammer, 14 Walesboro, paid for land, November 20, 1942. 14 payments at Walesboro, total $95,624, for 546.49 acres, averaging approximately $169 an acre, including building, other improvements and crops. # payments at Grammer, total $26,932, for 205 acres, averaging $131.35 and acre. 4 additional payments at Columbus Air Base, total $43,437 for 284.41 acres, averaging $152.70 an acre. 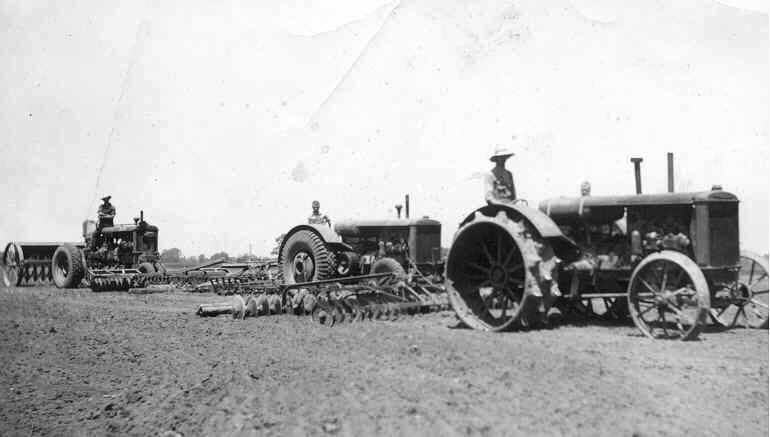 The late Henry Volez, 113.031 acres, $17,070. Larkin Sims and wife, 72 acres, $10,856. Emma Kruse Henderson, 39.45 acres, $5,951. Harry Steinker, 59.93 acres, $9,560." "6 more paid by government, November 28, 1942. Mrs. Margaret Talley, $43,090 for 260 acres at the air base. 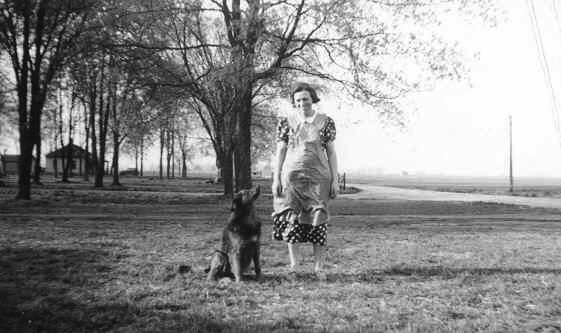 Mrs. Dorothy Perry Bahr, $22,064 for 155 acres at the air base. 4 others paid for land at Grammer, Walesboro and Atterbury." 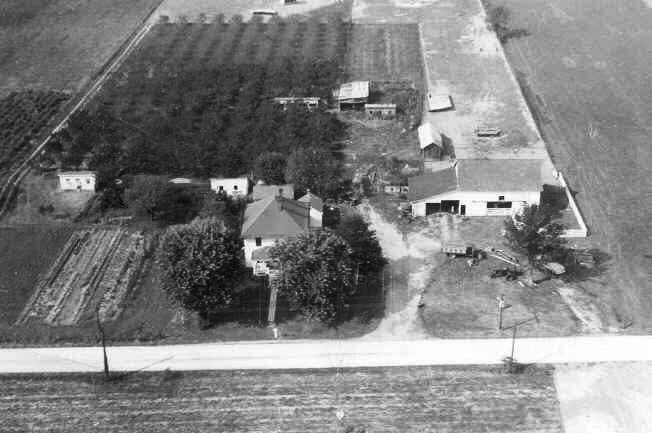 The home and farm of Walter & Elsie Steinker became part of the airbase in 1942. The home was preserved during construction and became the Base Commander's residence and was used as such for a number of years. The home was no longer used as the commander's house after Colonel (now Major General retired) John Hoff became base commander. It was then turned in to a storage building and later torn down. Its location was in the middle of the air field between runways. 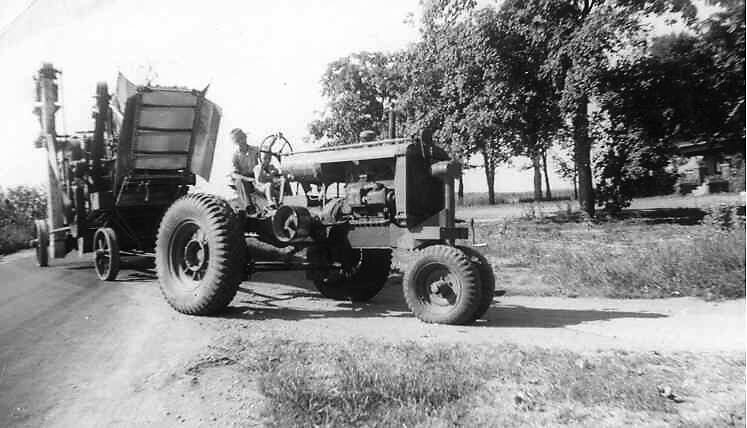 on a Huber Manufacturing Tractor which was built in Marion, Indiana. William is the smaller of the brothers. William and Marshall on the middle tractor. The farm home they moved to after the Army took their home for the base. Their new home was just a little south west of the airfield near what is now called Deerfield Place subdivision, on River Road in Columbus, Indiana. Their new farm home had apartments on the second floor and they rented to airbase officers. 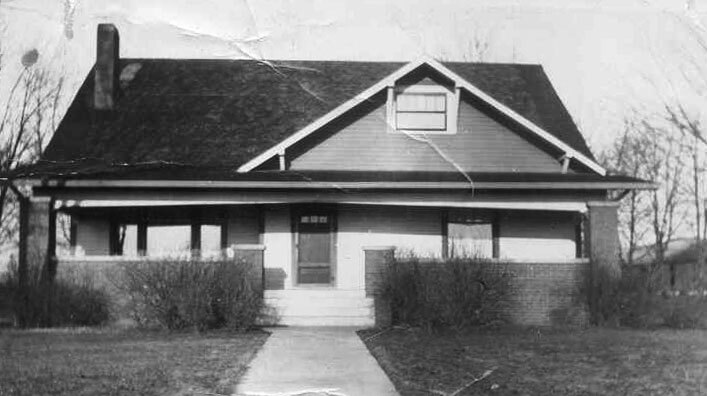 This home was also torn down years later and the property became tract homes. 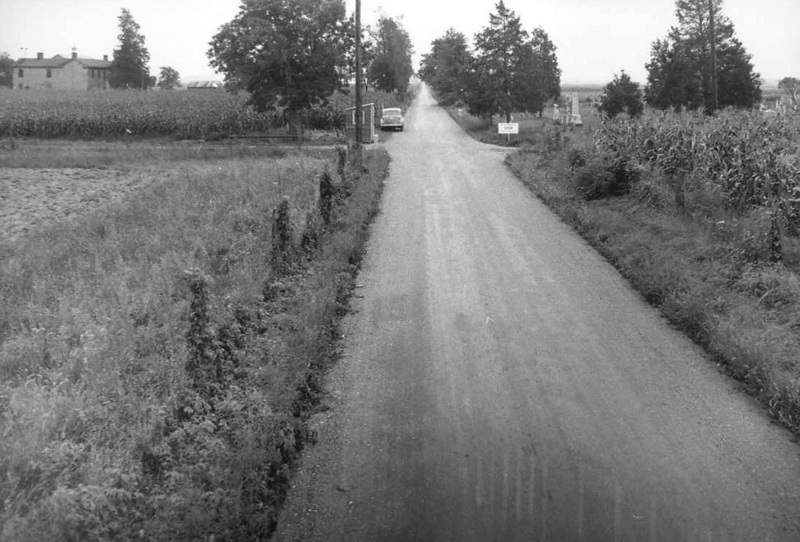 The road to the farm house that became the base commander's home can be visualized today by looking south from the Hawpatch-Liberty Cemetery toward the center of today's runways, as that was the road that passed in front of their home. 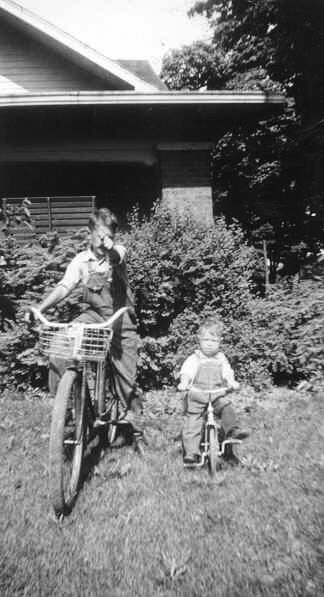 Most of these photos were taken in 1939 to 1941.